L M Krier is a pen-name of former journalist, freelance copy writer and copy editor Lesley Tither. Lesley writes crime fiction as L M Krier and is also a best-selling author of travel memoirs, writing as Tottie Limejuice. As a journalist, Lesley worked as a court and coroner’s court reporter, and later worked for the Crown Prosecution Service as a case tracker, giving her a good background knowledge of the British justice system. She is also an avid reader of crime fiction and enjoys watching it on television. 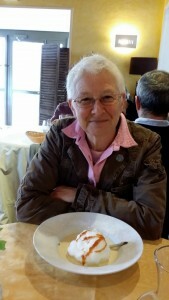 Lesley lives in central France’s Auvergne and holds dual French/British nationality. When she’s not busy writing, she enjoys walking and camping with her two rescued border collies. A prolific writer, she completed her first four crime fiction novels within twelve months. I love to tell a tale which provokes some emotional response from readers. If I can describe something in a way to make a reader laugh or cry, I like to do so. I’ve always written, from being very young, probably because my late father was a newspaper editor and reviewer. Most of my initial writing is done in my head. I like to get up, let the dogs out then go back to bed with a cup of tea, which is when the ideas will start to form. Then when I’m up and taking the dogs out for a walk, I’ll work the ideas up into some sort of a scene. After the walk, with a big mug of cinnamon cappuccino, I’ll start typing up what’s in my head. On a notepad next to my keyboard, I write out chapter numbers and a rough outline to what is in each chapter, then I can work ahead to see what needs to fit in where. I will very often have the end of a book in my head, even if it’s only in draft, before I actually start to write it. Very much so! My main character, Detective Inspector Ted Darling, seems to be in my head most of the time. I also had a real mental argument with the serial killer in my first book because I didn’t agree with the choice of one of the victims. I tried hard to prevent the murder, but I was powerless. One of the most useful things, I find, is to use beta readers (second eyes on whatever you write) who are ruthlessly truthful. As I write each chapter, I send it to the Alpha beta reader who will tell me honestly whether it is any good or not. And I do mean honestly – she can be brutal! Once I’ve worked through her suggestions, it goes to the other beta readers for their comments, and they will also pick up any typos. Most importantly, they will spot gaps in the plot, or things which don’t work out. But I can’t stress enough, they must be critical and not afraid to voice their honest opinions. ‘Wow, it’s fabulous’ may be very flattering but it’s not necessarily useful. I decided to go down the self-publishing route for a number of reasons. Being retired and therefore not in the first flush of youth, I was impatient to get my books out there to see how they would do. More so than ever these days, it can take a long time to find an agent or publisher who will even look at your work. Also, having been a professional writer and editor for a large part of my life, I am independent, with my own ideas, so I thought the Indie route might be the best option for me. I think and hope that there will always be a role for ‘real’ books. Reading ebooks is convenient and a cheaper option, but there is nothing to compare with the smell and feel of the real thing. Also many people do like to display their reading taste in their homes. There needs to be something to fill all those Ikea bookshelves!